Over the years I have found that our hobby has grown from a hobby to a number of services. Once we simply designed rules and then published them as we could find no one to publish our rules. The rules were very good but even good rules find it hard to find a publisher. Once I recall trying to entice a vendor to carry our rules at a Historicon. We had put on several very successful games and gave a way a few sets of rules which we had just published. I think it was Knight Hack First Edition. Today they would be very crude when compared to current standards. But that was a different time and with time our rule books have really improved. In design and quality, not to mention historical accuracy. None the less, as I was being shown the door, this young lady comes running up and started raving about our rules and how much fun she had playing them. The vendor was her father! Well later this vendor did carry our rules and even put an ad in one of them, at a later convention. Service? We do rules from cover to lay and then to publication and carried through our distributor network. Here is my break down of what we do as a service. Design period rules, from ancients to modern times. Help others get their rules to publication, either by advising or producing them. Needless to say there is not a lot to be made on writing rules. We create outstanding award winning buildings and terrain to order. 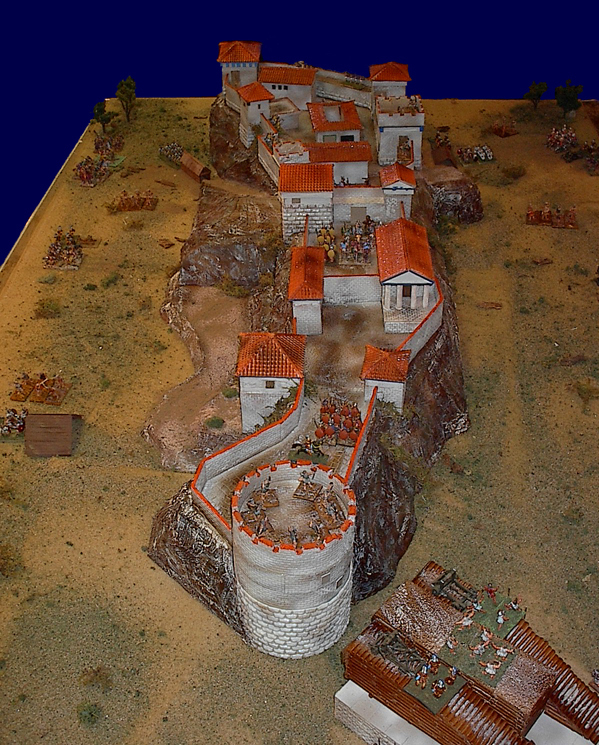 These are models of forts, castles and battlefield terrain. Aging, I am selling my painted figures which I used over the last 30 years or paint new figures at a price. My painting is up to gaming standards. Historical lectures on various historical subjects which includes sound research. Ok what about pricing for a service? From my collection painted models like elephants and chariots are 20 dollars each. Buildings including any you see on this site which are priced at 4 to 5 times the cost of materials, research is free. Shipping within the continental U.S. is via USPS priority mail and will vary. Paid historical lectures on various historical subjects which includes sound research, add travel expenses and lodging plus 100 dollars. Have figures and buildings; will travel. Check out our web site and Face Book for Classical Hack and LMW Works to keep up to date. Contact me though this site or www.lmwworks.com or Face Book.